NASA'S Hubble telescope captured an image of a baby star buried in interstellar gas and dust with massive jets emitting from it that seem to resemble a double-bladed lightsaber from the new film "Star Wars: The Force Awakens." Dr. Jennifer Wiseman said the image of dark clouds with a long gold line through it shows the birth stage of a new star system. 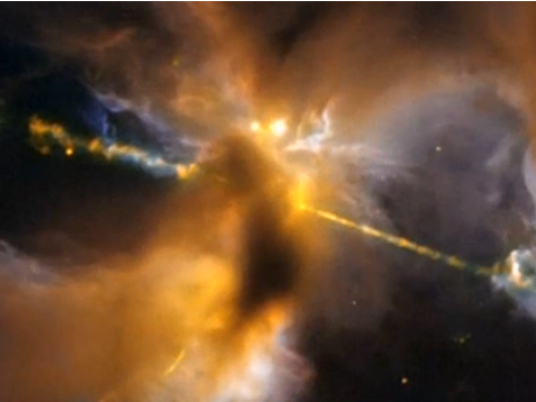 "This particular protostar system looks like a double-bladed lightsaber, which is timely with all the Star Wars frenzy going on right now," she added.